Finally, guilt-free, low-carb Italian!! 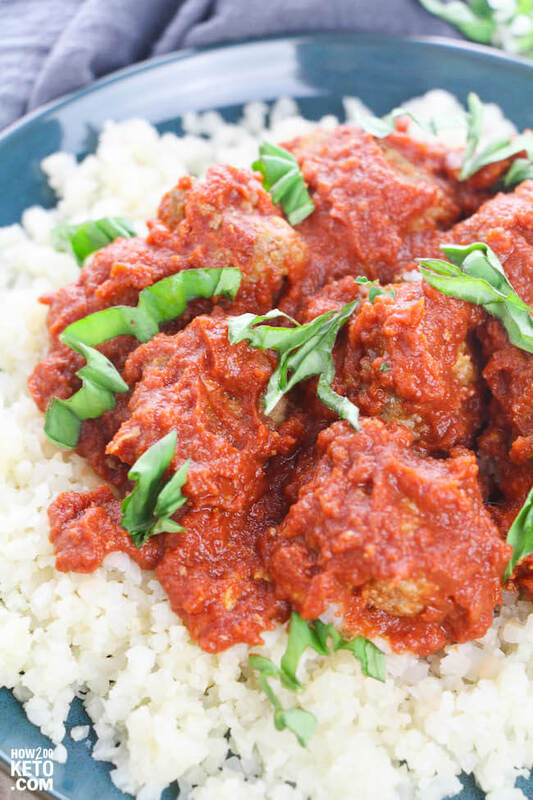 This Keto Meatball Marinara Recipe is a comfort food classic you can enjoy anytime! Usually Italian food is crammed with carbs – bread, pasta, the works! 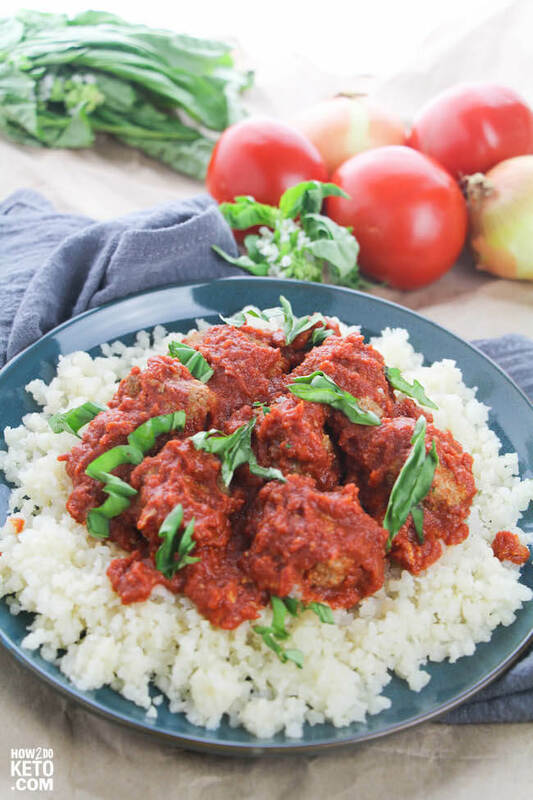 However, this Keto Meatball Marinara recipes provides all the comforting flavors of an Italian classic – guilt free! With 9 grams net carbs per serving, it is ideal for those on a moderate ketogenic diet (under 60 grams of net carbs per day). If you’re on a stricter diet (under 20 grams net carbs), this would be more of an indulgence, as it would be almost half of your daily carbs. Of course it is WAY fewer carbs than a traditional pasta dish! It’s definitely a winner in my book! 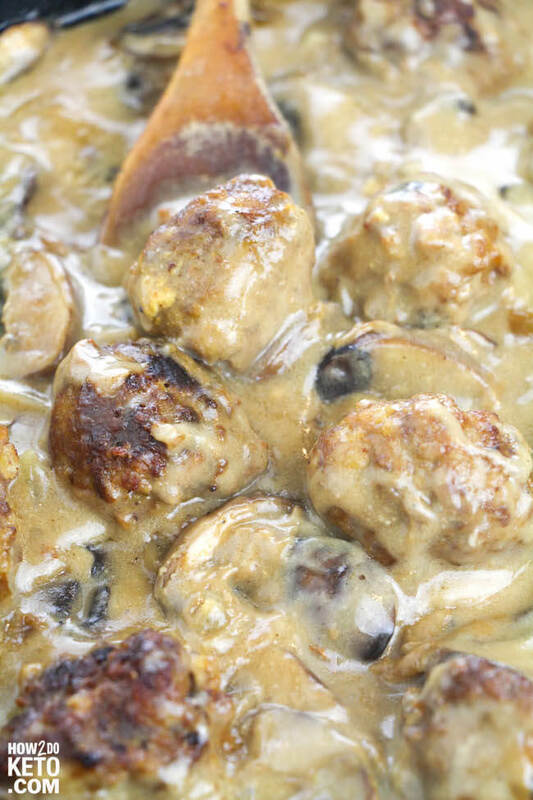 PS- If your family loves meatballs like our family does, be sure to check out our Keto Meatballs Stroganoff too! 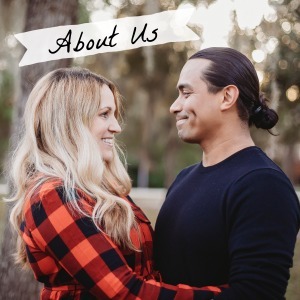 For your convenience in re-creating our Keto Meatball Marinara recipe at home, we’ve included shop-able ad links to some of the products and supplies used. Read our disclosure policy here. *If you can’t find Tomato Passata in your local grocer, you could instead use our Low Carb Tomato Sauce Recipe, made with fresh tomatoes. Tomato Passata differs from regular pasta sauce because it is simply pureed tomatoes with the skin and seeds removed. Unlike most pasta sauces or tomato pastes, tomato passata is uncooked and contains no additives. The above is a quick glance at the ingredients and tools needed to make Keto Meatballs with Marinara Sauce. Full ingredient amounts are available in the printable recipe at the bottom of the post. When choosing your beef and sausage for this recipe, look for higher-fat percentages. Look for pork sausage without any added sugar or fillers or opt for plain ground pork. 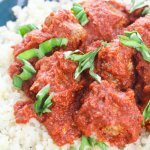 A large dutch oven is our favorite tool to make these Keto Meatballs with Marinara recipe, however, you can alternatively use a large frying pan or sauté pan. While meatballs cook, we prep and chop veggies and sauce ingredients. For a thicker sauce, place the pot in the oven for 10 minutes at 300°F. 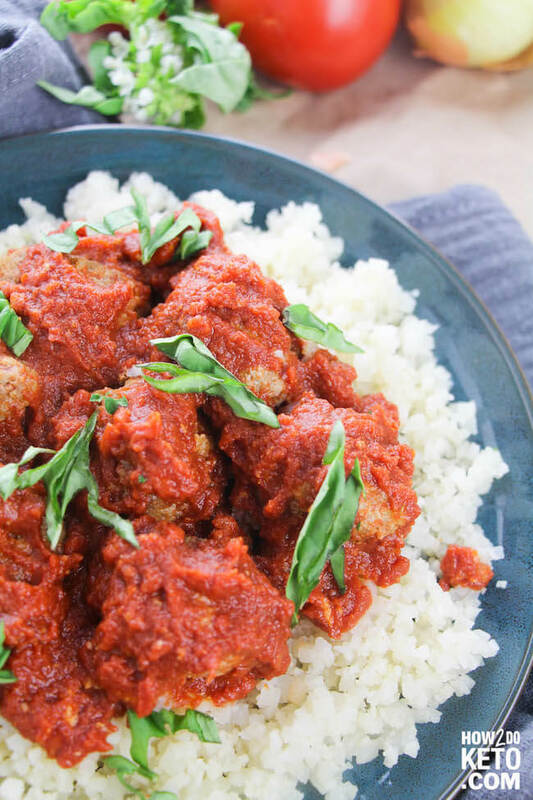 Serve over cauliflower rice and garnish with fresh basil. Related: See more of our favorite Keto dinner recipes here, like this Keto Tuscan Chicken! Finally, guilt-free, low-carb Italian!! 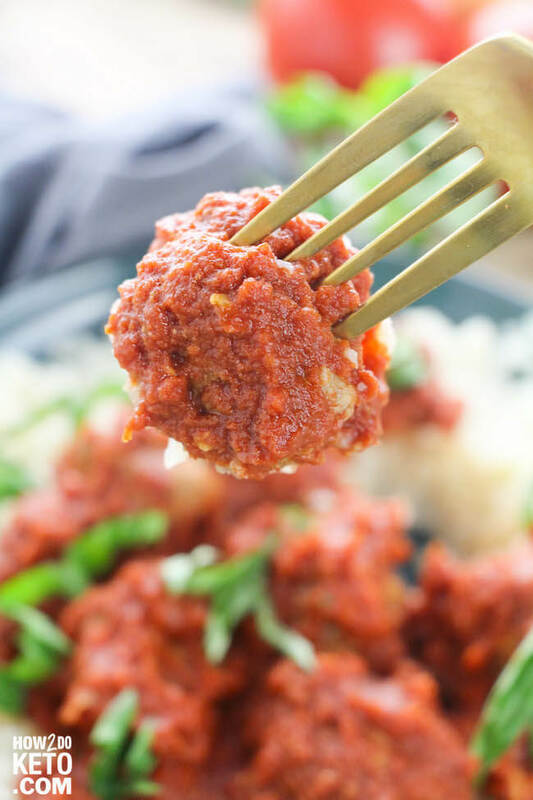 This Keto Meatball Marinara is a comfort food classic you can enjoy anytime! Heat your oil in a skillet or dutch oven over medium high heat. 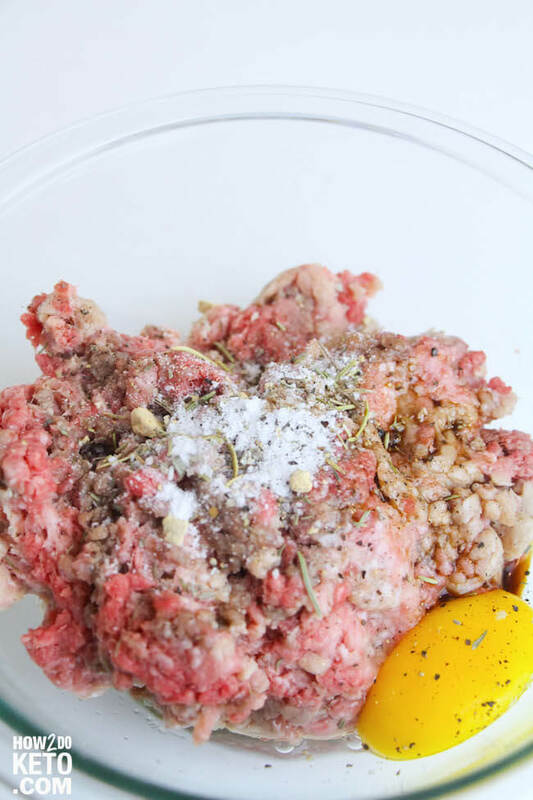 While oil heats, combine the beef, sausage, egg, almond flour, and seasoning in a medium mixing bowl. Form this mixture into large meatballs, about 1-2 Tablespoons each (depending on your preference). Place into skillet and cook for 8-10 minutes, flipping once as needed. 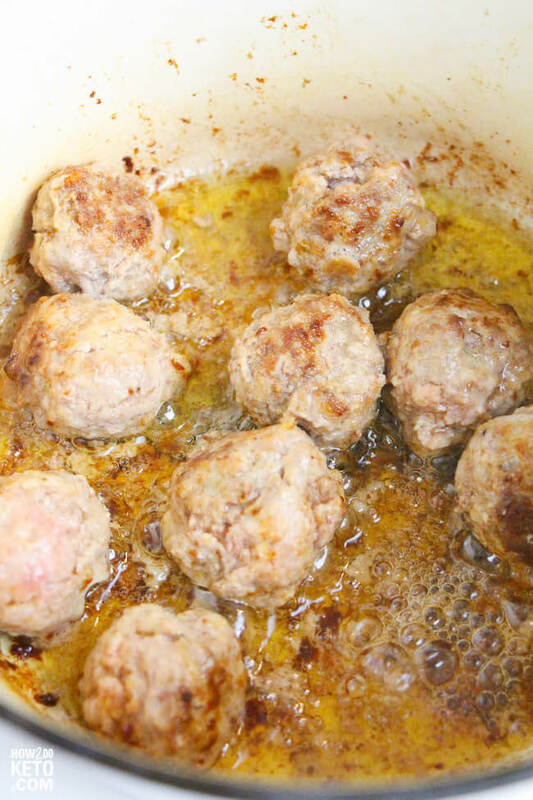 When meatballs are cooked through, remove from the pan and set aside. Add the onions to the same skillet used to cook meatballs and sauté until browned all over, turning with your spatula every couple minutes. Add garlic and cook for 1 minute, then add the tomato passata. If desired, add fresh basil, to taste. Add the meatballs back into the pan with your marinara sauce so they'll be warm and fully coated in sauce (about 2 minutes).